On September 10, 1997, Roomies! began publishing in Indiana University’s Indiana Daily Student newspaper. Simultaneously, it was thrown up on the web onto a Geocities site, making it one of the earliest webcomics, long before the term “webcomic” itself even hit widespread use. 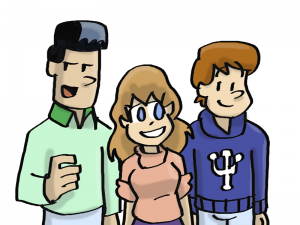 Since then, Roomies!, a college story, grew into the sci-fi epic It’s Walky!, spun off into both Joyce and Walky! and the toy store antics of Shortpacked!. Fifteen years later, the “Walkyverse” is still an ongoing, ever-expanding continuity. 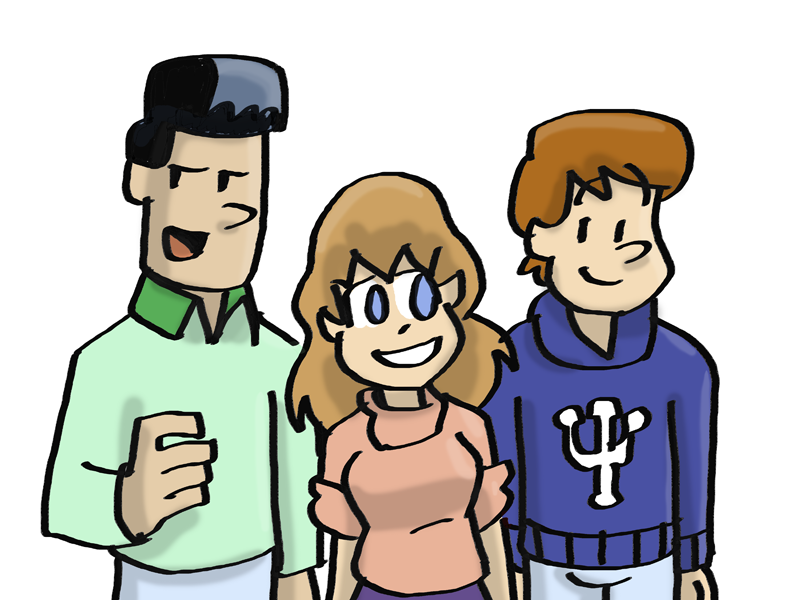 This website will organize the stories from Roomies!, It’s Walky!, and Joyce and Walky! into the best reading order, updating day by day, Monday through Sunday, from the beginning until the very end. Will this include It’s Walky! after Roomies runs out? *Shake Shake Shake* Turn it over. I’m hoping that the canon-but-I-couldn’t-afford-em paid strips will someday be included. is there any way we can read the old completed/finished strip still? i would love to go through the whole thing again without hitting a current day roadblock because the backlog. Just finished reading the old, completed(?) strip and was wondering if this will include the subscriber’s only stuff or if I could find it anywhere else. I’m dying to know what the deal is with the SPOILER SPOILER SPOILER Future Kids SPOILER SPOILER SPOILER and the full story behind SPOILER SPOILER SPOILER Head Alien II SPOILER SPOILER SPOILER. The Walkypedia is fine and all but there’s just this missing sense of closure, I guess. It’s gonna take five years to get to there, regardless. Either way I go on that decision, gonna be a while for the closure. Trying to understand: What’s the advantage of reading here vs. reading over at joiceandwalky.com? I’m wanting to read through and get all the content of the walkyverse, and I’m looking to do it as quickly as possible, so just trying to figure out the best way to do things. The advantage of reading here is that you get all of Willis’ material in chronological order (meaning the Roomies stuff he did after the comic itself ended gets placed at the point in the story it took place), with better definition and author’s commentary for most pages/strips. If you can’t wait for the rest of the non-Shortpacked content to get placed here, you can head over to joyceandwalky.com and read from 2001 onwards, buy “Roomies!” Book 2 for the epilogue stories (and something else while you’re at it?) and either buy access to the paid content of Joyce & Walky, or support the Dumbing of Age Patreon and look for the post with the links for it. everyday is webcomic artist appreciation day, and i finally caught up with what is posted here. thank you very much for making this long-run webcomic universe accessible in a fairly comprehensive way along with your current commentary. i started reading Shortpacked! a few years ago but only recently became interested in reading the original stuff. So I bought access to the paid strips of “Joyce & Walky!”, but I have no idea how to access it yet. It said on the store they just had twins, so I’m guessing I have to wait until I get sent a link for it?